Puranas, Agamas espousing arts, Varieties of several other books_ Oh Snake! While the Two gathered mud One built the kiln for ten months. The kiln, though wonderful, Is not worth a fraction of a coin. No one can cook the gourd that is painted on paper. Likewise despite searching in the eight directions there is no refuge. They build a temple for every town and pray ceaselessly. But has never seen the Lord’s feet. Where is the pariah woman? Where is the high-caste woman? Are there numbers inscribed on the skin and flesh? Is the pariah woman’s delight different from that of a the high-caste woman? Drawn milk doesn’t return to the breast. Churned butter doesn’t return to the butter-milk. The broken conch’s sound and the beings don’t re-enter the body. The blossomed flower and the fallen half-ripe fruit never return to the tree. Where are the temples? Where are the holy ponds? You loathsome people who worship the temples and ponds! Temples and ponds are in one’s mind. There is neither creation nor destrution. The God or religions are there to make person good human and not the ego centric racist. Every christian or Muslim or hindu should be more acceptable and should be ready to appreciate others religion by visiting each others church mosque and temples.We all believe in one god and its just our way of remembering the Divine power is different. but the bloodshed, hatred and ego shows that there are some loops holes present in the religion and because of this the society is suffering .United we stand, divided we fall, imagine if the World could be one, no Religions, no borders, no wars. The basics all begin at home, if the family can stand as one, that will be the beginning. If brothers & sisters learn to love and live in harmony, that is the beginning.Lets strive for well being, for a beautiful life on this planet. Let's break through the lines of religion, caste, community and even country. lets dissolve the borders. Let us be citizens of this planet. Let us care for this earth.Even Saiva Siddhantam[சைவ சித்தாந்தம்] Philosophy of Tamils is a way of life and This does not advise us to practice anything against nature or interfere with freedom and liberty of people. 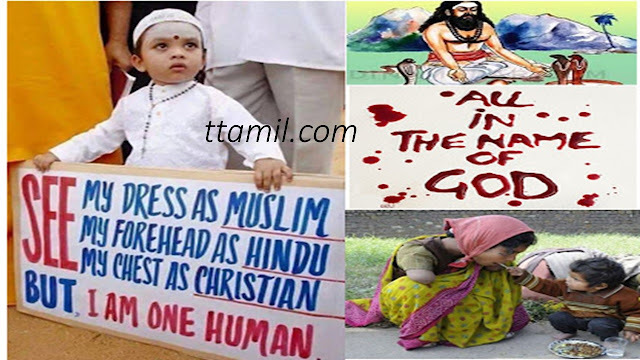 There is no place for superstitions and blind faith.In the name of God and religion, it does not divide or dissect people.They taught us that "God is LOVE and LOVE is God" ["அன்பே சிவம்" "ANBE SIVAM." -"தென்னாடுடைய சிவனே போற்றி ; என்னாட்டவர்க்கும் இறைவ போற்றி"]Our Saiva view of life is universal even,2000 years ago.Puranaanooru, proclaimed to the whole wide world :"யாதும் ஊரே, யாவரும் கேளீர்"/"every country is my own and all the people are my kinsmen. "and there by proclaimed universal peace!